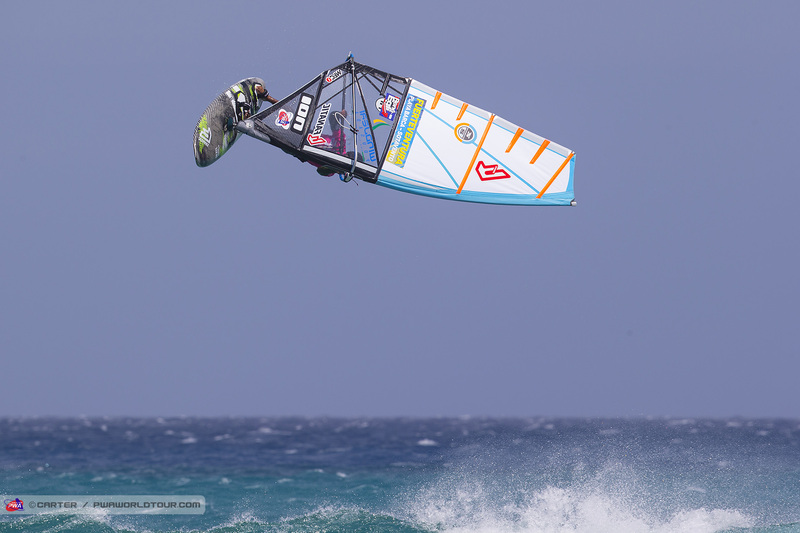 As forecast, Fuerteventura delivered the goods for the second successive day, which enabled the men’s and women’s single eliminations to be completed in even better conditions than yesterday. Over the course of the day, there was plenty of world class action as the world’s best delivered an outstanding show. Come the end of the day though it’s the reigning world champions - Sarah-Quita Offringa (Starboard / NeilPryde / Maui Ultra Fins) and Jose ‘Gollito’ Estredo (Fanatic / NorthSails) - who head up the event rankings after the 9-time and 7-time freestyle world champions produced superb performances to deservedly win the single eliminations. Last year’s World No.3 Oda Johanne (Starboard / Severne / Maui Ultra Fins) sailed an excellent semifinal against vice-world champion Maaike Huvermann (Starboard / Severne / Maui Ultra Fins) to book her place in the opening winners’ final of the event. The Norwegian started off in fine form by landing a regular kono before adding a skopu, flaka, shaka and forward loops on both tacks to setup a tie against reigning world champion - Sarah-Quita Offringa. Sarah-Quita Offringa peaked at the perfect moment as she produced her highest scoring heat of the contest in the final - 137.3 points - as she linked together another majestic display. The Aruban gem is going in search of her 10th successive freestyle world title and based on her latest showing it’s hard to see anyone stopping her. In the final Offringa landed an array of the latest power moves - burners, konos, culos - with shakas, air flakas and a massive toad to leave the result in no doubt, while unfortunately Johanne couldn’t scale the heights of her semifinal performance with the Norwegian completely overpowered on 4.0m. In reality, it wouldn’t have made a difference to the result with Offringa posting a score that would have rivalled many of the guys scores in the opening round of the double. Arrianne Aukes (Fanatic / NorthSails / Maui Ultra Fins) made the brighter start to the losers’ final against Maaike Huvermann, but the current vice-world champion gathered momentum as the heat progressed and a quick flurry of tricks earned her 3rd place in the single and the 19-year-old will now look to fight back in the double elimination. Reigning world champion - Jose ‘Gollito' Estredo - and vice-world champion - Amado Vrieswijk (JP / Severne) both sailed superbly in the quarterfinals and semifinals to set-up a mouthwatering winners’ final. Gollito defeated Adrien Bosson (Fanatic / NorthSails / Maui Ultra Fins) before producing the performance of the day to defeat Yentel Caers (JP / NeilPryde) as the Venezuelan racked up a humungous total of 191.4 points with a spectacular display of sailing, while Vrieswijk manoeuvred his way past Steven Van Broeckhoven (JP / NeilPryde / Shamal Sunglasses) and Jacopo Testa (RRD / RRD Sails). In the battle for third and fourth place Yentel Caers took on Jacopo Testa and for the majority of the heat, it looked as though Caers had the final place on the podium wrapped up after dominating the duel at the beginning. However, as the losers’ final headed towards its climax the Italian found his rhythm and staged a superb comeback to secure a first ever podium and he will now do everything in his power to defend that position in the double elimination. Meanwhile, Caers was extremely disappointed that his bongka was adjudged to be outside the competition area, while he performed one of his best moves, a burner into one-handed burner, when he was out of moves on starboard tack. However, take nothing away from Testa, who has certainly stepped his game up and seems to be starting to fill his potential. After the conclusion of the single elimination, the double elimination soon began with the conditions continuing to fire and even in the opening round of the double there were several outstanding displays, which is testament to the level of the current standard on the world tour. Youp Schmit (99NoveNove / Avanti) was on the wrong-side of a very close heat against Antony Ruenes (Tabou / GA Sails) in just the second round of the single, but he again showed why he is such an exciting and dangerous talent as he produced the highest scoring performance of the first round with a polished display consisting of a pushloop, backloop and radical shifty to name just a few and he will now face 18-year-old Johnny Yagen (RRD / RRD Sails). The Young Israeli sailed out of his skin to defeat Bjorn Saragoza (Starboard / Hot Sails Maui) - who was previously ranked as high as 6th in the world - which marks a disappointing return to the world tour for the Bonairean, but Yagen deserves all the plaudits and was visibly delighted upon hearing the result. Elsewhere, Adam Sims (Patrik / Sailloft Hamburg) produced an excellent jumping display to end the hopes of Julien Mas (JP / Gun Sails), while Italy’s Riccardo Marca (Fanatic / NorthSails / Maui Ultra Fins) looked extremely impressive in Heat 31a with the Italian producing his best heat so far on the world tour. Italy’s Giovanni Passani (Tabou / GA Sails / AL360) won an extremely close heat against Japan’s Yuma Kobayashi (Starboard / Severne), which saw the lead change hands on several occasions. Julian Wiemar (Starboard / Severne) will be ruing not checking his equipment as the German was firmly in contention against Russia’s Yegor Popretinskiy (Fanatic / NorthSails / Maui Ultra Fins) only for a snapped inhaul to ruin his chances of progression. In the final heat of the day, Italian Francesco Cappuzzo (RRD / RRD Sails / AL360) made the most of the diminishing conditions to book his place in the second round and he looks as though he can be a continued threat going forwards. The forecast looks excellent again for tomorrow which should result in another day of world class freestyle. The skippers’ meeting has been called for 10:30am - with the action commencing from 11am (GMT+1) onwards. Make sure you tune into www.pwaworldtour.com to watch all of the explosive action as it happens via the PWA live stream.